Preparing children for real life: Part of our jobs..! 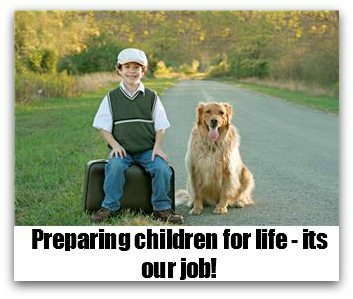 Preparing children for life as they get older is part of our jobs as parents, wouldn’t you agree? Our eleven year old left yesterday morning on his residential trip, we won’t see him or speak to him until Friday. He has been away without us before for sleepovers with grandparents, uncle and aunt and on cub camp. But for some it will be the first time away from their parents and that can be a little bit stressful for both the child and parent. He will also start secondary school in September, so I have started to let him walk to and from school on his own. Last week at half term I let him and a friend cycle to the recreation ground near where we live, we meet them their about an hour later. It is a bit of a challenge to let go, to trust them; our natural instinct is to protect them, but our ultimate goal is to send them off into the world. Even when they are younger we are preparing them. Often, when crossing the road, I have asked the children to look and tell me when they thinks it’s safe to go so they learn and judge for themselves, and don’t always rely on me. Putting the DVD’s and CD’s back in the boxes; which we still seem to be working on in this house! Sometimes it feels they have grown so quickly that the last ten years have flown by. People always said it, but until you have gone through it you don’t quite believe them. There are some things I love though….my older two can both make cups of tea and they are both allowed to go to the shop to buy the milk we forgot earlier! This is our regular Tips for Parenting guest post by Beckie Whitehouse from Be Confident Coaching. Image above courtesy of Microsoft Clipart. I think it’s always hard to let the first one go, or even just the first time with any of the others, but it does get easier. Letting them go to school activities or day camps can really help because they need the experience socializing with other kids away from their parents. But that doesn’t make it easier for parents does it? Hope all is well! This is something with which I struggle massively. Sausage is due to go on a school trip in a couple of weeks and we’ve already said no. I tried to volunteer but apparently parents can’t do that anymore and I simply don’t trust anyone else to take her to a zoo without me. She’s only 4 but its something I’ll really have to work on as she gets older. Great post, lots of food for thought. Thanks, Jayne. Going to Zoos and the like really, really helps I think. But as you say, sometimes when they do go – they need Mummy’s/Daddy’s guidance and understanding to help them through it. Surprised that ur school / nursery won’t allow u to go – u would need to have a child protection thingy but other than that? We allow parents to help at the school I am governor, as long as they have had the right clearance. Patience and I am sure Sausage will make it.